To be perfectly honest we were disappointed with Railay. 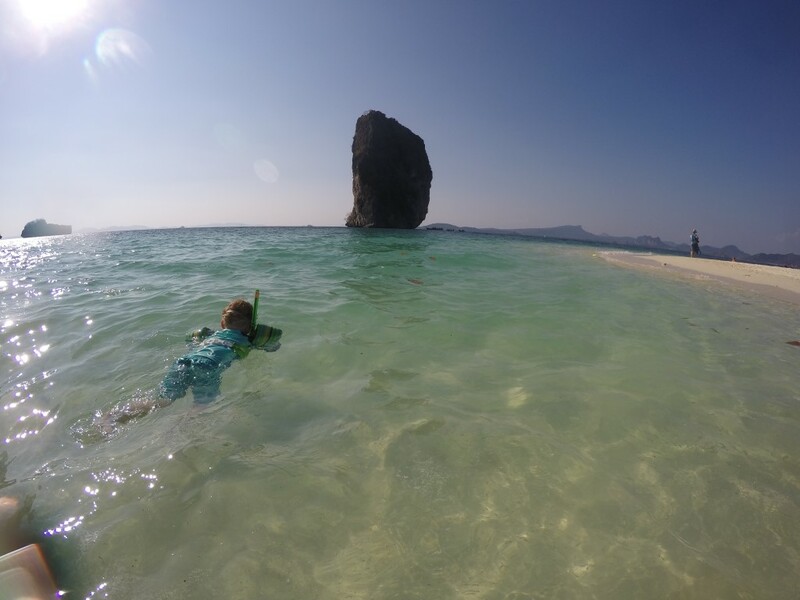 We had heard that Railay’s beaches, especially Phra Nang, were among the world’s best, if not the best. When we arrived we found Railay West and Phra Nang beaches beautiful but small and crowded, with cloudy water and tons of long tail boats. The peninsula itself was also crowded, with many areas littered with trash. Prices were significantly higher than elsewhere in Thailand. Our island hopping tour from Railay was another story though. Getting out on the water away from the crowds of the peninsula itself we found the paradise we had read about. White sand beaches with some space to breathe, and crystal clear blue water. 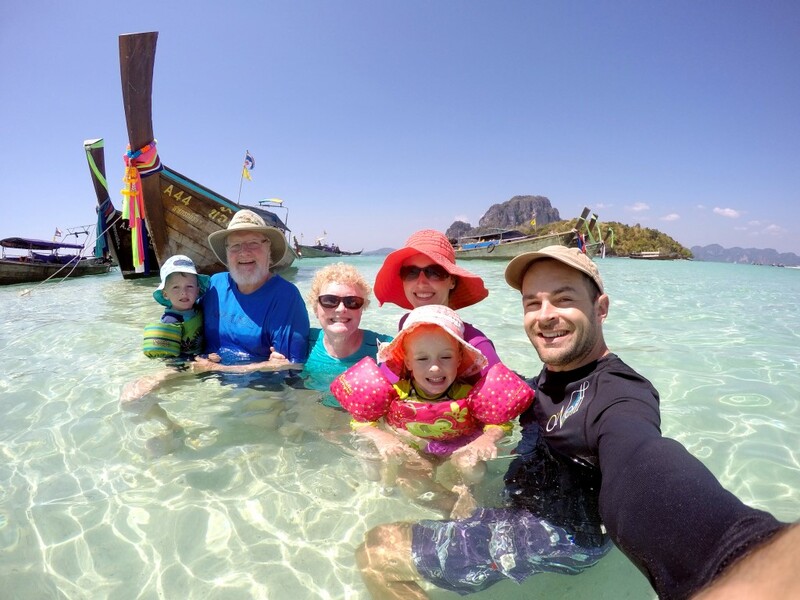 We had a great time island hopping from the Railay peninsula to nearby islands including Poda Island and Chicken Island. We also loved our deep water solo rock climbing adventure which included island hopping on a big sailing yacht. Unlike our island hopping trips in El Nido, in Railay we chartered an entire boat. We were traveling with Nana and Papa and the price for the whole boat was comparable to paying individually as part of a shared trip. The process of booking the island hopping trip in Railay was easy. 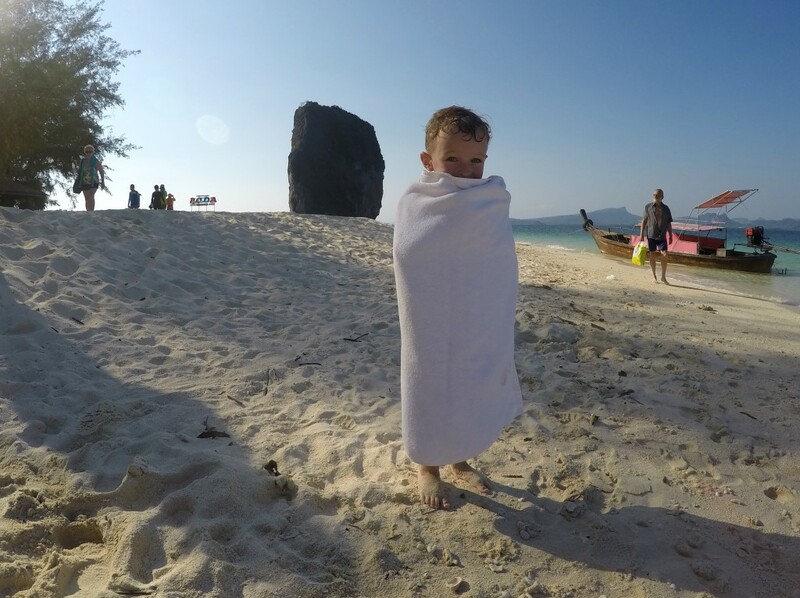 We simply walked over to Railay West beach the morning that we wanted to go island hopping, and inquired about a tour at the small booth on the beach. A few moments later we were walking down to the long tail boat with our captain for a day on the water. The itinerary for the Railay island hopping trips are more or less fixed, though you can adjust them a little bit to fit your needs. Our tour included 4 stops: 3 beaches and 1 snorkeling spot. Our first beach was on the back side of Poda Island. We actually were heading to Chicken Island but saw that this beach on Poda was deserted and beautiful. We asked our boatman if we could stop there first instead and he obliged. We were treated to a long stretch of white sand and warm clear water that we had mostly to ourselves. After Poda we went on to Chicken Island for some more beach time and lunch. The beach here was a bit more crowded and there were many boats, some playing pretty loud party music. But it was a fun and festive scene and we were mostly there to eat so it was fine. Some of the boats were package tours that included lunch so they had buffets set up on the beach. Our tour included just the boat so we ordered some food from the cafe. The cafe selection wasn’t great, and we ended up with just a couple of mediocre chicken sandwiches (to be avoided), some fries, and a couple of fruit shakes. When we finished our lunch we got in a nice swim amongst the long tails. We’re all about the seflies in this post. Snorkeling was next on the agenda. The snorkeling spot was a cove not to far from the main Chicken Island beach and it was full of gorgeous coral and colorful fish. A highlight of snorkeling in this area was the brilliantly colored giant clams. The private long tail tours like ours seem to go to a different snorkeling spot than the larger tour boats. It was nice seeing such a beautiful area without the crowds. There’s no real beach so you just jump off the boat, which the kids weren’t thrilled about. Aurora went in eventually but Jasper sat this one out. Luckily the water was so clear, and the fish so plentiful, that we had a good time showing them fish right from the boat (aided by a few scraps of bread). Our last beach stop was back on Poda Island, but this time at the spectacular main beach. This area has a wide expanse of sand bending around two sides of a point. A huge karst rock looms nearby in the water making for a beautiful vista, especially in combination with the colorful long tail boats. Jasper did get some snorkeling in at Poda Island. 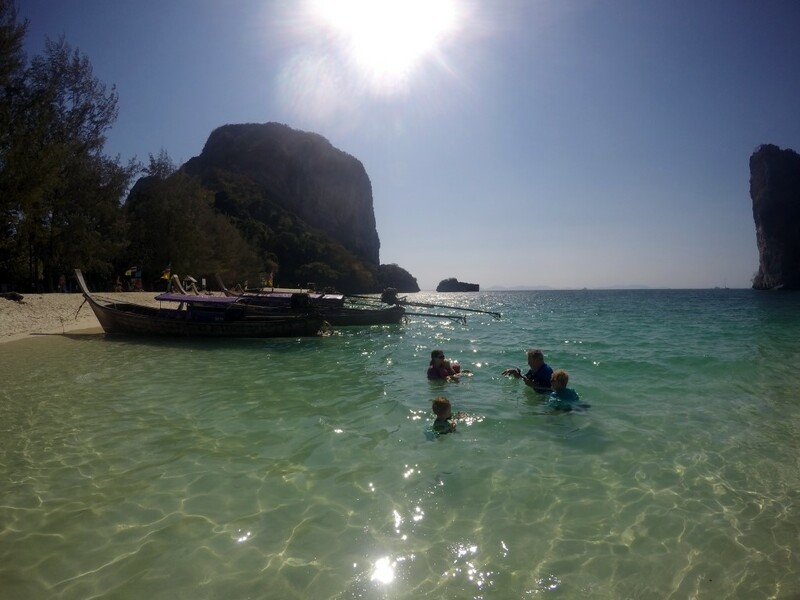 When we were finally able to drag ourselves away from the gorgeous Poda Island beach we motored back towards Railay enjoying the views made more beautiful by the late afternoon light. Our boatman was kind enough to drop us off at the Railay east dock instead of the West Beach where we started. This saved us a bit of walking which was much appreciated at the end of a long hard day of lounging on the beach. Overall the cost was 2,500 baht ($75) for the whole boat for the day including tip. We gave the boatman a decent tip since he was so accommodating of our various requests. He also didn’t rush us from one spot to the next at all. We felt like we set the pace and the agenda, which is priceless for trips like this. Lunch on Chicken Island was on the expensive side at 580 baht ($18). 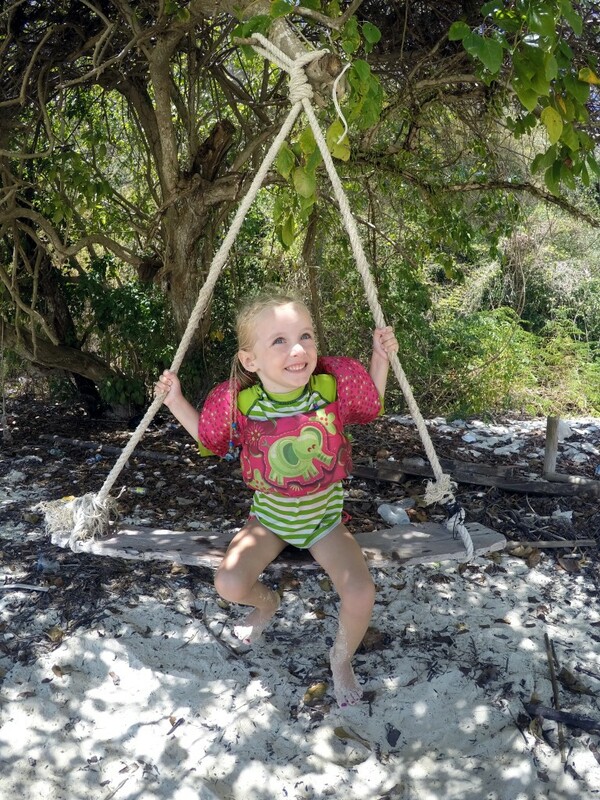 We had a great time on our island hopping tour from Railay and, along with our rock climbing trip, island hopping was definitely the highlight of our stay there. What a great thing that your mom and dad could come for a visit, too! It all looks wonderful…..Stay safe….